Nortel i2000 IP telephones are a cost-effective IP deskset offering specifically optimized with values and features. 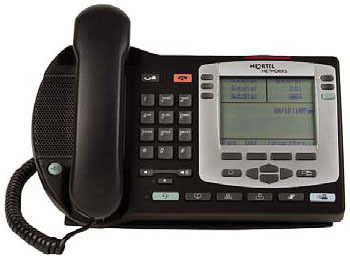 The Nortel i2000 (Phase 2) IP Phone Series Portfolio consists of the Nortel i2001 IP Phone, Nortel i2002 IP Phone, Nortel i2004 IP Phone, i2007, and the i2050 Softphone. The Phase 2 Nortel i2000 IP Phone Series features include an ergonomic and advanced design, high-quality handsfree speakerphone, and character-based displays. The IP Key Expansion Module for the Nortel IP Phone i2000 Phase 2 Series is an accessory that can be added to the Nortel IP Phone i2002 and i2004 models. The Nortel IP Phone i2000 series is an innovative portfolio of IP Phones which include multiple softkeys, integrated speakerphone, advanced audio-quality technology for crystal clear conversations, headset support and an integrated Ethernet switch for single desktop wiring. The sets can be easily customized for advanced users. Note: Nortel 2000 Series IP Phones are compatible with Nortel BCM 50/200/400, Nortel Communication Server 1000/2000/2100, Meridian 1, Meridian Communication Server 5100/5200, Media Gateway 1000B Expansion, and Survivable Remote Gateway SRG/SRG50. Please ensure your system meets the minimum configuration requirements when ordering these IP phones. The Nortel IP Phone 2001 (Phase 2) is an entry level, single-line desktop IP telephone designed specifically for public areas such as lobbies, cafeterias, hallways, and break rooms. It is also ideal for low call traffic locations such as school classrooms and hotel rooms. The Nortel IP Phone 2002 is a standards-based IP Phone that connects directly to the Local Area Network (LAN) via RJ-45 connector. The i2004 IP Phone is feature loaded and also supports the IP Key Expansion Module. The Nortel IP Phone 2004 (Phase 2) is ideal for managers, executives, and officeadministrators, this multi-line phone features a large LCD display screen capable of displaying a maximum amount of information, and is well-suited for high call volumes. The i2004 IP Phone is feature loaded and also supports the IP Key Expansion Module. The Nortel IP Phone 2007 incorporates a 5.7” (12.7cm x 17.8cm) color touch-screen, bringing multimedia presentation support to the desktop IP Phone 2007. Virtual Network Computing technology optimizes content pushed from external application servers in advanced text or graphical format.